In certain areas of the world, the ground transport infrastructure is so poor (or nonexistent) that getting goods to people who need them is as good as impossible. UK-based company 4X4 Aviation sees a way to correct that problem with the monster of a cargo plane they call the VV-Plane. The VV (or Versatile Vehicle) Plane features 16 tilting electric fans that allow for vertical take-off and landing, eliminating the need for airports and runways. 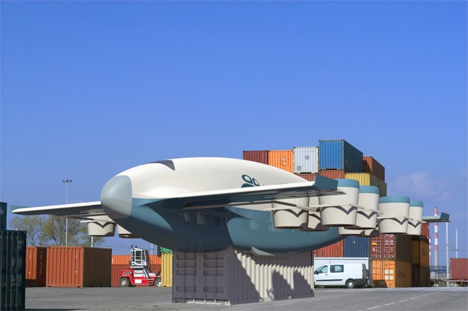 According to the company, the unusual plane would greatly reduce the costs associated with moving goods, making it possible to deliver food, supplies, and equipment to even the most remote places which are unreachable by roads. The cost to weight ratio would be lower even than that of trucks, making the VV-Plane a viable alternative for areas that do have solid existing road infrastructures. The plane’s four groups of four electrically-powered fans are powered by an integrated combustion engine generator which sends energy to an on-board storage system. The fans are pointed down during take-off to provide lift, then pointed backward while in flight for forward thrust. While similar tilting fan systems require a lot of energy and heavy equipment, 4X4 Aviation say that they’ve developed a new system to make the entire outfit affordable. 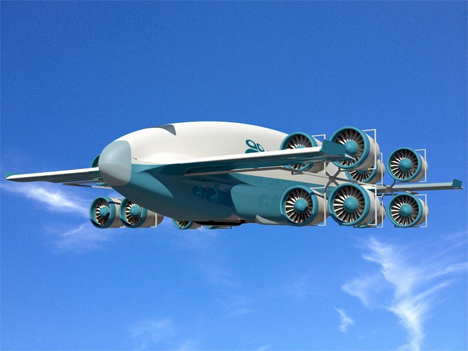 The VV-Plane is equipped to carry up to 33 tons of cargo and can even carry a standard cargo container. This is a crucial point because the plane could pick up the containers at sea ports and move them inland easier and for a lower cost than trucks could. 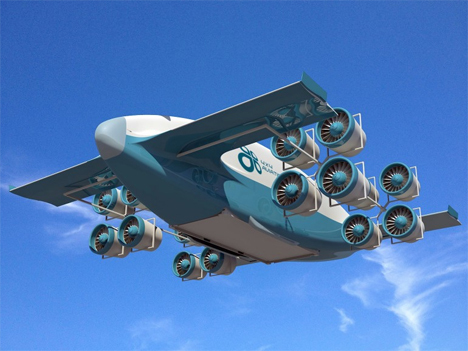 The company is seeking investors to help develop their cost- and energy-efficient technology, so there’s no word yet on when we might start seeing VV-Planes hauling our cargo through the sky.